SAN LUIS OBISPO, Calif. /California Newswire/ — 5 Bars Communities, a dba of XG Communities LLC, a premier provider of wireless plans, asset marketing and engineering services for cities and municipalities across the United States, announced an agreement to market and manage wireless coverage solutions with the City of San Luis Obispo. “San Luis Obispo is known for being a refuge and one of the happiest cities in America, part of the SLO charm is the aesthetic quality of the town. 5 Bars will expedite and enhance wireless coverage for this lovely community without compromising the look and feel of this quaint college town,” said Monnie McGaffigan, President of 5 Bars. San Luis Obispo is a quintessential coastal California city located halfway between San Francisco and Los Angeles and just minutes from beaches, state parks, landmarks and premium wine regions. The town offers a historic, restored downtown full of restaurants, theatres, art galleries, shops and is home to California Polytechnic State University. 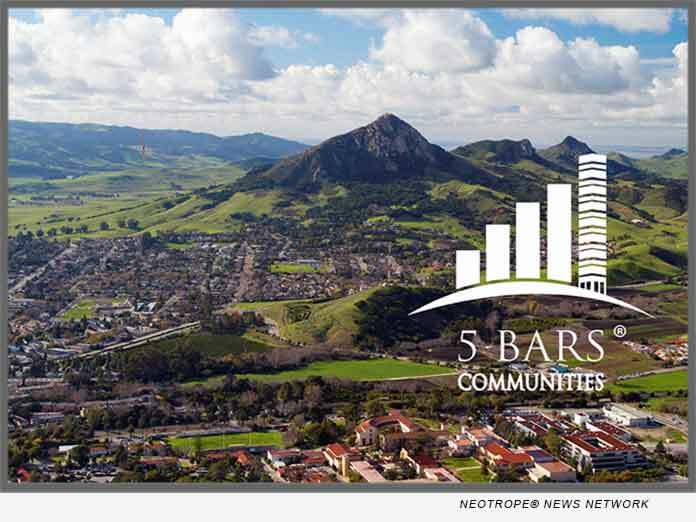 5 Bars Communities, a dba of XG Communities is headquartered in Irvine, California. A premier provider of small cell wireless marketing plans, engineering services and comprehensive wireless strategies for cities and municipalities. For more information, please visit http://xgcommunities.com/.